"A little nimble in the air but also well mannered. Following the manual, I am proud of a well flying aircraft. My thanks to Skystar. Please receive a photo of N893 and also a photo of my wife, Carin. Because we all know, without our ladies we wouldn't have our airplanes. Eric Ashman. Atlanta GA"
"Complete October last year, 80 hours to date. 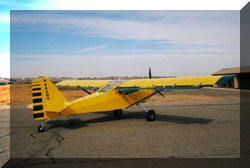 Can hit VNE in level flight with the IO-240 at full power (2800 rpm's), comfortable cruise at 120 mph (2450 rpm's). I have a Sensenich prop." "Just a note to say thanks for the years of great customer service and technical support. N995BW (Serial# JBS 070) had its first flight in October 2003. I now have 10.5 hours of trouble free flight testing. Thanks again." "I have about 80 hours as of October 30th 2003, been doing night flights and everything is working real nice." 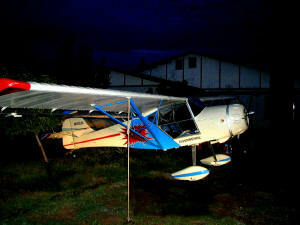 "My Kitfox Vixen made it's maiden flight on August 28th. 2003. 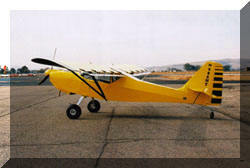 The flight lasted 15 minutes and the flight characteristics are perfect"
"For your info is a Kit Fox IV with a Rotax 912 with 95 hp (with the conventional kit of 95 hp) and the Czech 1200 Aluminum Amphibian floats, I am cruising around 85 mph indicated (65%)."